The plot of the kabuki play Keisei kakehashi monogatari (Story of a courtesan and a bridge over the gorge: けいせい棧物語) appears not to have survived. Arashi Kitsusaburō II later used the stage name Rikan II. Kitsusaburō II performed two roles in this production, as Tsukimoto Hajimenosuke (月本始之助) shown here, and as Hyakusei Jūsaku (百姓十作). The poem is signed by Kiyokuni, probably a member of the Jukōdō poetry circle and a pupil of Yoshikuni. 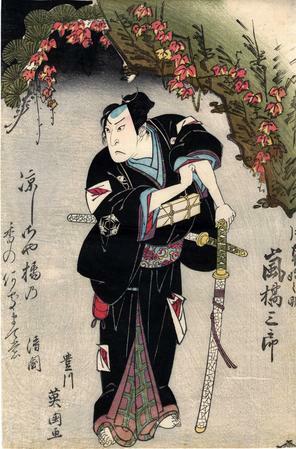 The imagery used in the poem includes references to the tachibana (orange blossom: 橘), the crest (mon: 紋) of the actor Kitsusaburô (who also used the name Rikan II). Provenance: This impression is from the Haber Collection, this example is the illustration in Schwaab, Osaka Prints, number 107. Prints from this collection are admired for their fine color preservation, and often for their rarity, as with this artist and subject. Reference: Kabuki nenpyō (Chronology of Kabuki), Ihara, T., p. 156. There is another copy in black and white in Ukiyo-e Masterpieces in European Collection 5: Victoria and Albert Museum II, Kodansha, 1989, on page 192.